Lifespan: One year (most species) or three years (May beetles and June bugs). Brief description: Grubs, also called white grubs, are actually the larvae of many different species of beetle, including the Japanese beetle, scarab beetle and masked chafer. They may be mere babies, but grubs cause turf damage that is anything but adorable. Grubs are the larval or immature form of many species of beetle. They are white, wrinkly, C-shaped creatures, ranging in length from ¼ to over one inch long, with soft, squishy bodies and legs near the head. 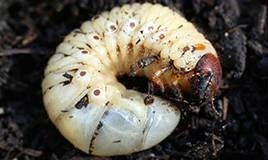 Grubs are one of the most vexsome lawn pests in the United States. They live in the soil, feeding on the tender roots of grass. Their presence can go undetected until significant damage is already done. Like other insects, beetles go through four stages of development. For most species in the Eastern United States, their full lifecycle takes one year. They begin as eggs, which the females lay in the soil in July. Then, after two weeks, the eggs hatch into their second form, the grub, or larval phase. As grubs, they eat a tremendous amount of food, molt (shed their skin), and grow. In the autumn, when temperatures drop, grubs burrow down into the soil, spend the winter below the frost line, then move back up toward the surface in early spring. They feed on roots one more time and then enter the third, pupal stage. Finally, in late June to early July, the insect emerges from its pupae as an adult beetle. Then they look for food and a mate to begin the cycle again. Grubs lurk beneath the surface of the soil, and they are usually only noticed after they have begun to cause damage. Grub damage appears as irregular, unsightly brown patches of turf. It usually shows up in August and can easily be mistaken for drought stress. But unlike a lawn parched by drought, grub-infested turf will peel up easily from the soil like a piece of carpet, because the roots are gone. Other signs of a grub problem are turned over, damaged areas of grass, or flocks of birds descending upon your yard. Birds, moles and skunks consider grubs a fine delicacy and will ransack your lawn to feast on the buffet of beetle babies. You can prevent grubs from becoming a problem by keeping your lawn healthy. Fertilize it, mulch the lawn, and keep your grass at least two inches long. Beetles prefer to lay eggs in close-cropped grass. Water sparingly and when you do, give the ground a good long soak. This will encourage grass to grow strong and deep roots that are less susceptible to damage. Aerate your soil regularly. Beetles prefer to lay eggs in compacted, undisturbed soil. Before treating your lawn for grubs, first try to estimate the extent of the infestation. Turn over the top layer of soil in your garden bed or tug on a square foot of sod. If the grass peels back like a piece of carpet, or if you see six or more grubs per square foot of sod, you know it’s time to take action. It’s also valuable to identify the species of grub, as certain treatments are only effective for specific grub types. Nematodes are tiny worms that live in the soil and kill grubs of all kinds. They require careful handling because they are a live product. Milky spore is another natural method for controlling Japanese beetle grubs, and its effects can last for up to 10 years. However, it usually takes a few years to become established in the soil, and it requires a host grub, so it cannot be used in combination with chemical grub controls. It also does not work against other types of grubs. When it comes to chemical treatment, timing is everything. The best way to prevent a serious grub infestation is to locate the little buggers early, right after they hatch and start to feed. This is when they are most susceptible to treatment. For most species and regions, July or early August is the ideal time to treat your lawn for grubs. Chemicals indicated for grub control are carbaryl, halofenozide, and imidacloprid. Apply the product according to the package directions. Contact your local lawn care specialist to discuss a program that will eliminate grubs and prevent further damage to your lawn.